Hot on the heels of a widely-publicised altercation between ANC Deputy Secretary-General Jessie Duarte and eNCA journalist Samkele Maseko, the governing party has described separate meetings held between the party and the broadcaster as well as the South African National Editors' Forum (Sanef) as "cordial and robust". The ANC in a statement said "in both meetings, we agreed that the incident that happened on Tuesday between the Deputy Secretary-General of the ANC, Ms Jessie Duarte, and the eNCA reporter, Mr Samkelo Maseko, was unfortunate and not in the spirit of a professional and mutually beneficial relationship". "The ANC acknowledges that healthy tension between political parties and the media is inherent in a democracy. Mutual respect, professional ethics and appreciation of each other’s roles is central to managing this tension." 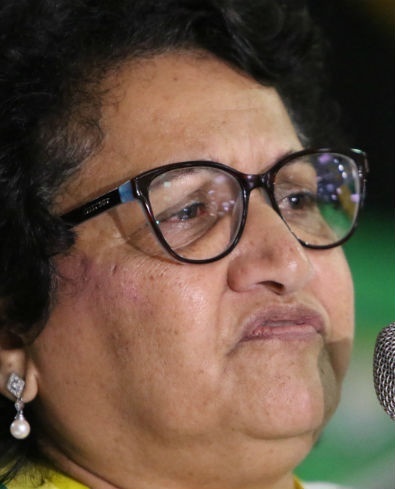 News24 previously reported that on Tuesday, Duarte had a heated exchange with Maseko, with each accusing the other of being a bully after a dispute during a media briefing at Luthuli House. During the exchange, Duarte labelled Maseko "arrogant" and a "bully". Duarte was briefing broadcast news stations on the special National Executive Committee meeting that took place on Monday. In the recorded incident, Maseko is heard complaining to Duarte about her attitude towards him. She then accused Maseko of having a habit of thinking he was "the lord of the media". "You call me a bully, but you are the worst bully. I have never met anyone who is as arrogantly disposed as you are, and you want to defend freedom of speech you never fought for. And you don't defend freedom of speech, because your particular TV station has decided the direction it will go on," Duarte said. The ANC's statement continued "political parties in a constitutional democracy have a right to have their programmes covered accurately and fairly." "The ANC reiterated its commitment to media freedom, and assured both eNCA and Sanef that it would continue to defend and champion the media’s right to report without fear or favour," it added. eNCA editor-in-chief Jeremy Maggs said the station stood behind its reporter. Maggs said the station rejected any assertion that it had an agenda against Duarte or the ANC, or that its reporter had bullied her, as she had suggested. Duarte accused Maseko and the station of being anti-ANC and using a slogan close to that of the DA during the 2016 election coverage. In response, Maggs said: "In this robust pre-election political climate, we reserve the right as an independent media house to ask all political representatives from all parties any questions we deem are in the public interest, and will continue to do so. Duarte's claim that our payoff line during the 2016 election was 'Time For Change' is incorrect. We used the line 'Your Independent Election Channel'."